The early exploration of Mossdale Caverns began due to the initiative of one man coupled with the strength and endurance of another. One of these men was the notoriously abrupt but relentless Eli Simpson known as Cymmie, and the other a young aircraft engineer with a very strong sense of adventure and stamina called Robert Dove Leakey, always referred to as Bob. 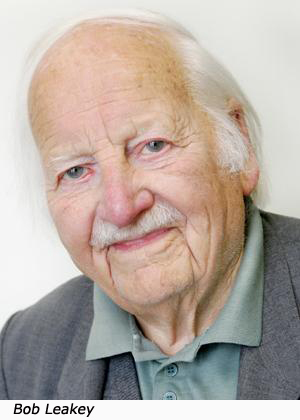 During the late 1930s, Cymmie, a founder member of the British Speleological Association, gathered together a large number of early geological records and old mine plans covering the area between Hebden Gill and north towards Bycliffe Hill. His interest in these documents was driven by his belief that the answer to the last major unsolved speleological problem of the Yorkshire Dales; the Mossdale Beck Grassington Moor- Black Keld resurgence enigma, could be found in the abandoned lead mines of Grassington Moor. He was convinced that the longest and deepest cave system in the British Isles lay beneath the Moor. In 1937 Cymmie put in a great deal of time and effort in investigating the area, both on foot and at his desk, and by the end of 1940 he was confident that his efforts would lead to the discovery of an extensive cave system and possibly the deepest cave in Britain. His first attempt to find the postulated caverns was concentrated near to the village of Grassington. His interest was focused on two large resurgences near the village; Grassington Low Mill by the river Wharfe and Braith Gill 1/4 mile south-east of Ghaistrill's Strid. When that approach proved to be unsuccessful he turned his attention to the deserted mine shafts on Grassington Moor. Cymmie had heard the story told by the old lead miners, of a large cavern discovered by ‘T'owd Man’ under Grassington Moor. He had the notion that if he could locate this lost cavern, it might provide a way into the cave system he believed lay underneath the Moor. About this time Cymmie enlisted Bob Leakey to aid him in his search. Together they began to systematically explore the mine shafts and accessible levels that lie between Yarnbury and further away across the moor to Peru and Turf Pits Mines. For completeness, they explored and surveyed all the drainage levels that poured into Hebden Gill. Once more this method produced no results and finally Cymmie turn his attention to the large stream that disappeared at the base of Mossdale Scar. The date was late April 1941, when Bob Leakey began his search for a way into the caverns he believed lay beyond the jumble of fallen boulders at the foot of Mossdale Scar. He commenced his search where the large stream of Mossdale Beck disappeared beneath the forbidding Scar. Due to the ongoing war, there weren’t many fit young men around to assist him; accordingly, Bob enlisted some of the young girls who worked with him at the aircraft factory in Yeadon. On May 31st, 1941 searching for his pipe which had fallen from his mouth into the ruckle of boulders beneath Mossdale Scar, Bob found the way into the stream passage beyond the scar. Within a short distance Bob dropped down a narrow fissure into a pool of water which to make further progress he was forced to duck beneath, because of this he named the entrance ‘The Lavatory Basin'. By the end of 1941 Bob Leakey, together with his team of Women were joined by Lewis Railton. 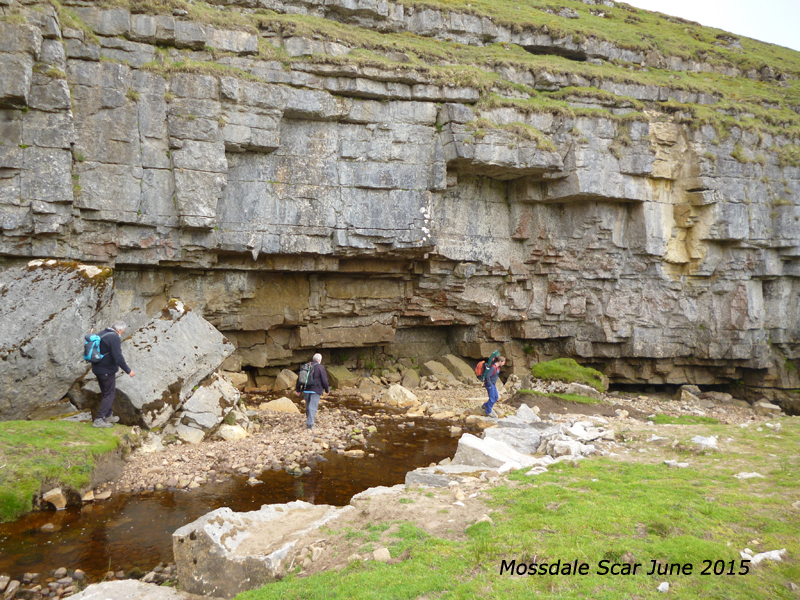 In a few months they had explored almost four miles of cave passage beneath Grassington Moor. The survey of the Mossdale Caverns was completed after many long arduous trips into the cave, some lasting several hours. In order to expedite the surveying and avoid the necessity of making the long laborious trip to and from the entrance, Bob would sometimes visit a dryer part of the cave; once there he would cover himself with sand and go to sleep. Leakey came to the conclusion that the only possible resurgence for the Mossdale Caverns stream was the Black Keld resurgence 750 feet below in the valley near Kettlewell. But his newly completed survey proved that the cave was heading in the totally opposite direction, towards Hebden Gill and the Grimwith drainage area. 1940; I had a car, nobody else had. We went up to Mossdale area because there were one or two caves there that nobody seemed to have any record of and we were exploring them. It was a case that nobody could get into that hillside at all, water just disappeared. I eventually found a bit of a sump there down the bottom, it was a drier area just big enough for somebody to crawl through. I had practiced holding my breath for as long as I could counting up to 79, 80, 90 a hundred and so on. I used to have this very strict system that I could just go one third of how much breath I could hold, and then I had to turn around which sometimes took a whole third, another third and then get out as quick as I could. I started that system on Mossdale and I only needed to do about two dives in like that, and I managed to push enough rock away from the far end and let the water out. I went down sometimes on a Saturday night and two other nights at least, sleeping in the cave because there was some fairly dry sand, and if you scraped yourself a hole in there and laid well down in the hole and covered yourself up, you could sleep quite comfortably for a few hours at night and then carry on next day you see. Did you see much evidence in there of flooding? Yes, I think the second trip I suddenly noticed puddles on the floor slowly getting a bit bigger and suddenly I met the water coming up towards me you see. So I had to sort of scramble like hell to get out, and I began to sense there was a sense of danger. From then onwards none of the other people would come with me and all the exploring I did was more or less on my own. Not particularly, by then I was beginning to know how to handle fear. The fact that it’s there like Mount Everest means that it has got to be explored. There’s that thrill of being frightened it’s rather like the first time you take a flight into the air and overcome your fear and land safely, that the sort of joy that you get, gives you the real kick in life.